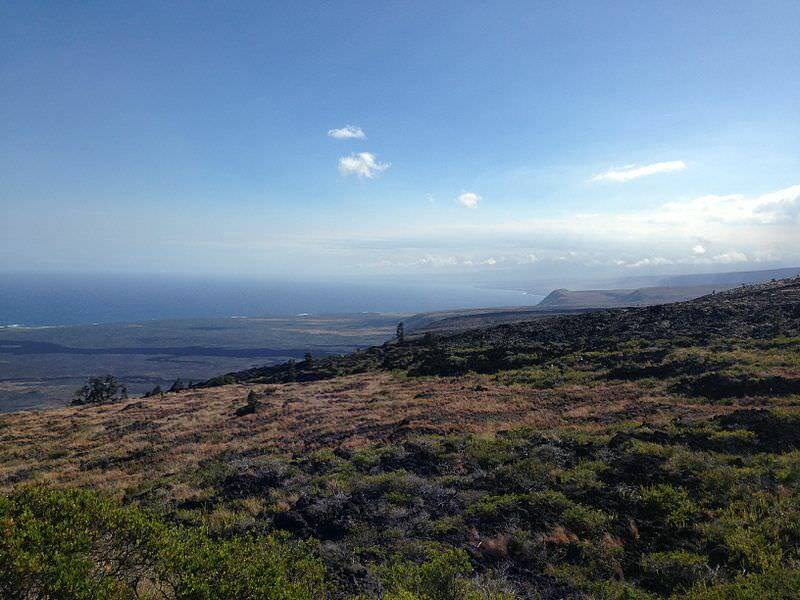 The Ka`u District is almost barren part of the Big Island of Hawaii. It is on the south side of Mauna Loa. Hawaii Belt Road 11 loops south from the Kona Coast and south from Volcanoes National Park to the southernmost tip of the United States at Ka Lae, South Point. The town of Na`alehu, in fact, lays claim to being the southernmost residential area of the US. Pahala town a sugar plantation until the mill closed in 1996. No coffee is starting to become an important factor here. The passage through Ka`u alternates with farming land, rugged coastal areas, hills, mountain slopes, dry upland forests and lava deserts. It’s a sparsely populated area. The South Point Road leads 11 miles off from the main highway to Ka Lae, the South Point. At the end of the road are boat launching facilities used by local fishermen. There is also an old heiau (temple) and fishermen’s shrine. From this area, a backcountry road along the coast leads to Green Sand Beach. Among the area’s main attractions is Punalu`u Black Sand Beach Park and its resident population of Hawaiian green sea turtles, which are easily seen just offshore. Manuka State Wayside Park has a unique dry forest nature trail and small botanical garden.